Before I forget, thanks for all the comments about my recent FOs. 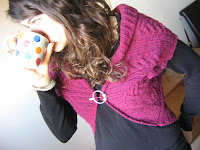 I tend not to reply to comments unless I have something productive to say, but I do always read them and go over to any link that's left with them - I've found a load of new knit blogs from comments. So, another FO. I finished this ages ago. But it was a gift for my mother's birthday, so I had to hide it. I used about two and a half balls of luxury tweed. 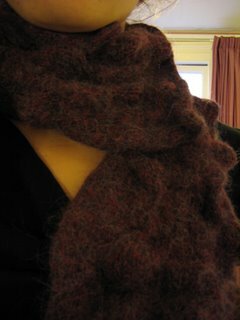 It was just a simple st st scarf on 3.25mm needles. When finished, I arranged some marbles at each end - kept inside the fabric with rubber bands - and threw it in the washing machine for a spin. As previously documented, our washing machine loves felting. Once dry, I removed the marbles and popped the bobbles out. I'd been wanting to try this technique for ages and very pleased with the result. The colour should suit my mum well, and it's not too fussy (without being something too simple and boring for a birthday present). It's also incredibly warm and soft. What a nifty little technique. I didn't have too much faith in it when I read about it but your results are encouraging. What a great idea! It makes such neat little bobbles! oh i've seen that technique before.. isn't it japanese? very cool. i love the way it turned out. Lovely! Such a clever technique. One thing I've wondered about is how it stands up to washing. 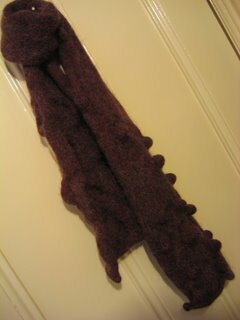 Are the physical changes casued by the felting process strong enough to keep their shape when washed gently by hand? Beautiful scarf. I've used the Shibori felting technique for scarves. It's fun and easy to do. 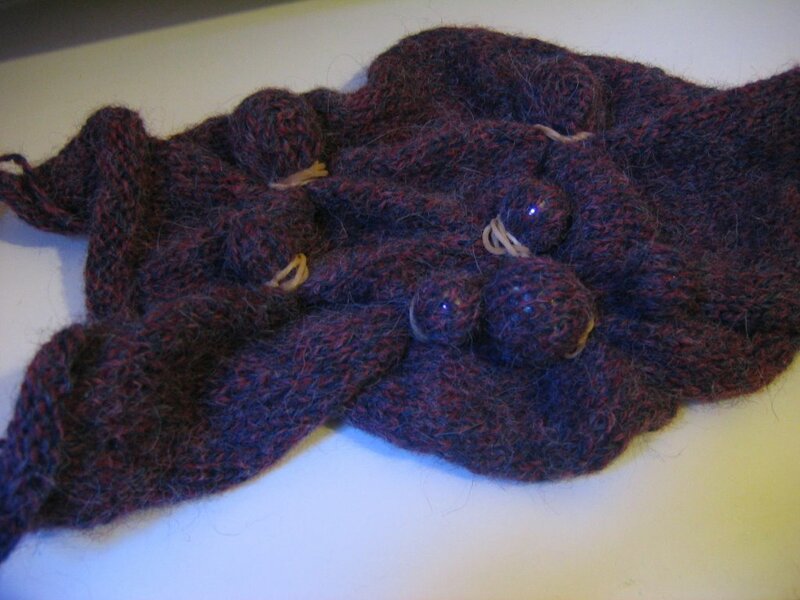 The effect of the marbles seems to be that that bit doesn't felt, so although you have to be a bit careful with blocking when you wash it, the scarf does keep it's shape. techniques, including folding while you felt, etc. Think Shibori is a general Japanese term, as I first heard it mentioned for dyeing. Might mean 'resistance' or similar, as that's the outline of the dyeing method. It is a lovely technique... lots of bobbly Hats have sprung to mind! Lovely effect- I wanted to see some shibori knitting for a while. I always think it is quite similar to tie-dying really. Also I don't know if you saw this on Crafster -its an exchequered with space invaders theme!